Does your crawl space or basement feel damp, or do you see mold? An interior French drain system is a very good long term solution, and it protects your home from excess water. Long term exposure to too much moisture has severe effects. Drain systems are a good solution. DinoDry are experts in drain systems, and we help manage your moisture and water problems. Installing a Basement Drainage System is not a do-it-yourself kind of project. If a drain system is installed incorrectly, then it could actually cause more damage to your foundation. 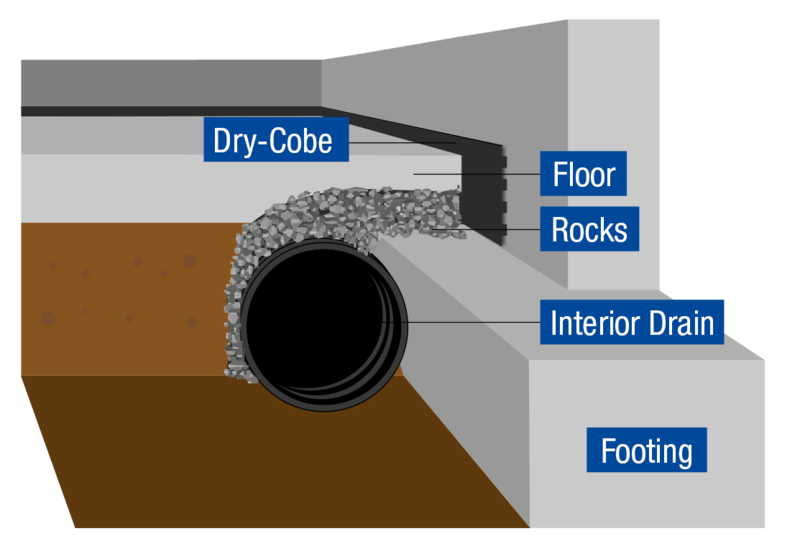 As you can see in this diagram, the actual drain piping is positioned underneath the basement or crawl space floor, and it is next to the foundation footing. Specially designed mesh filter material and gravel create a channel for the water to flow into the drain pipe, and then it carries it on to a sump pump. In some cases, the drain takes the water to the outside, and this allows it to drain naturally. DinoDry professionals help determine the best solution for your water and excess moisture problems.